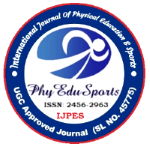 International Journal of Physical Education & Sports (IJPES) is a peer reviewed and referred journal, formally publishes high-level original research articles made in the field of physical Education & Sports. The journal will publish peer-reviewed, original papers representing a variety of quantitative and qualitative research methods. Case studies of work between sports scientists and coaches are especially encouraged. The journal also encourages the submission of papers, including advocacy pieces, which may have been presented in a forum or special interest group at a conference; and philosophical works that address connections between sports science and coaching. The peer review process is open, meaning that both authors and referees know each other’s identity. Such a process, with its transparency, is in tune with the mission of the Journal.